Direct-vent fireplaces were invented during the 1980s, and although they have become quite common in American households, many new users still have questions about how these fireplaces work differently from traditional fireplaces. Direct-vent fireplaces have become popular in part because users don’t need a masonry chimney in order to operate them. Instead, they use double-wall pipe and are vented horizontally through a wall or can be vented vertically through a roof. Part of what makes these fireplaces so sought after is that they are fairly easy to place and install compared to wood fireplaces. 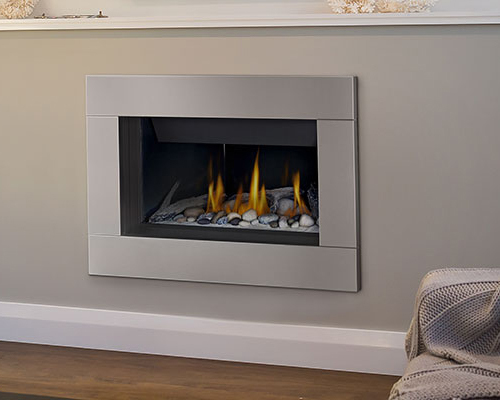 The direct-vent fireplace burns behind a glass shield and expels all gases outside of the house. This sealed glass panel is inoperable and is sometimes placed behind a protective screen. It is how these fireplaces remain efficient. Having this sealed glass panel also ensures that air coming into the fireplace from outside and gases leaving the fireplace do not come into your room. Also, it keeps the air in your room from escaping through the fireplace. Direct-vent fireplaces cannot be operated without having this glass sealed in place. Once the fireplace is up and running, the glass panel can get very hot. Hence the protective screen that is placed in front of the glass. The area surrounding the fireplace can get hot as well when a fire is burning—in some cases, it can get as hot as 190 degrees. Most direct-vent fireplaces are turned on by a wall switch or a remote control. After pushing the “on” button, you’ll want to wait for the fireplace to respond on its own. If you hit “on” too many times, you can lock out the fireplace. If the fireplace doesn’t respond after several minutes, try to repeat the process after waiting a short time. If that doesn’t work, contact your fireplace dealer. Next, you’ll want to adjust the flame height. How high a flame is determines how much heat it puts out. This is done either by remote control or by manually adjusting it directly on the fireplace unit. Some of these control panels are accessed by removing the decorative front or at the bottom of the unit. Once the decorative front is removed, there are generally two dials you’ll see on the fireplace. One will be a pilot knob, with an option for “on” and “off.” The other dial will usually just say “hi” or “lo” and this is the knob you want to use to adjust the height of your flame. Many direct-vent fireplaces also have a fan option, manipulated either by remote control or manual control near the flame height knob. This can also be adjusted to preference. The fan helps prevent cold air from being blown into your home when you first turn your fireplace on. It also make sure that warm air from around the fireplace is kept blowing into your room, even when the fireplace is turned off. Keeping your fireplace clean is another important step in the maintenance of your unit. Naturally, you’ll do this with the fireplace off and after it has cooled down. After removing the decorative front, simple release the spring clips that hold the glass in place. A special glass cleaner can then be applied to the inside of the glass, where a white residue often collects. It is simply rubbed in and wiped off using a non-abrasive cloth such as a paper towel. You can purchase this cleaner at your dealer. For the outside of the glass, you can use regular glass cleaner to remove smudges and fingerprints. Just make sure the cleaner doesn’t have ammonia in it. Other than having to clean the glass, a direct-vent fireplace can have a few other drawbacks, mostly related to maintenance. For example, if a black soot-like substance collects on the glass, this probably means that something isn’t working correctly in the fireplace combustion process. This requires dealer attention. Also, small cracks can appear in the glass. If you see this, it likely means that the glass is getting weak and needs to be replaced immediately. One other disadvantage of having a direct-vent gas fireplace is that you may smell gas coming from the fireplace. This should never happen, and if it does, you should immediately leave your home and contact the local fire department. It is possible that the gas smell is due to something that is easily repaired, but it is still critical to have it looked at by the installer or dealer. Direct-vent fireplace units are generally more efficient than traditional gas fireplaces or wood-burning fireplaces. They use natural gas or propane, but most of it is converted into heat and it sealed off by the glass barrier to keep heat inside the home. No flue is needed, so there is no risk of backdraft. As previously mentioned, direct-vent fireplace versatility allows them to be placed just about anywhere in a home, which is something that regular gas fireplaces and wood-burners can’t offer.